I had the task to make my Outlook Task List appear on my iPhone. As everyone knows Apple did not do anything about todo lists or tasks on their phone… well there’s an app for that: Most of the task applications on the iPhone use Toodledos services to sync task lists with the desktop. To sync the Toodledo service with the desktop you need another tool. This tool uses your Toodledo account and your locally running Outlook to sync between both. 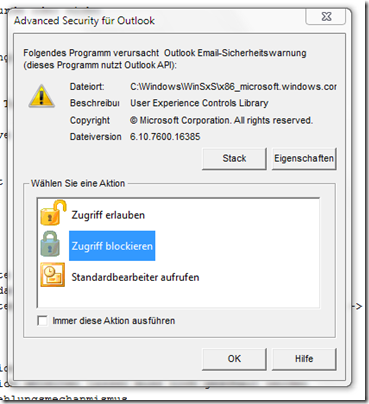 So this little desktop sync tool needs access to the Outlook data: This means you will maybe be bugged by Outlook that some program wants to have access to the data. You can allow it for a number of minutes but not forever. Okay one solution would be to install appropriate antivirus tools to suit the operating systems security needs. Because this wasn’t a solution in my case I needed something more sophisticated to solve the problem.